How can you not love a city that has a pub with vinyl cushions on the wall above the gents’ urinal, so you can rest your head while you ‘go’? Where you can order a beer without Prague is not only the capital, but also the largest and most important city in the Czech Republic. It is situated in the center of Bohemia and also, it can be said, of Europe. It stands in the rugged territory of the Prague basin, which is penetrated by adjacent spurs of the Central Bohemian Hills. Few of the world’s cities are as tightly tied to the history of their nations and countries as is Prague, and it is believed, despite the paucity of historic reports, that this situation has persisted from the beginning of its existence right up to the present day. The majority of the most important events, including revolutionary upheavals, which influenced the course of history of the whole country, took place in Prague. This is true in every sense but most of all in regard to political and cultural matters. 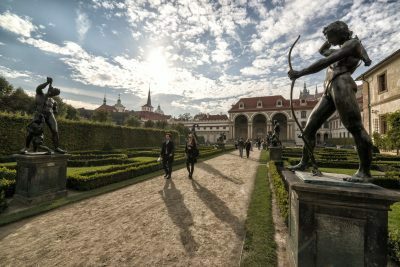 Prague has always inspired writers, poets, musicians, painters, sculptors, architects, photographers, film producers, etc., to produce works, many of which rank among the peak of Czech, European, and even world, culture. It all started a million years ago. The Prague basin has offered settlements excellent natural conditions since prehistoric times. Its elevation put it in a position that was relatively easy to defend, and it had fertile soil and plenty of water. The first hunting party arrived here roughly one million years ago. Long-term inhabitation was established during the early Stone Age (about 5500 BC – 4300 BC). Archaeologists have documented all kinds of prehistoric Central European cultures here. Around halfway through the 6th century AD the Slavs moved into Prague’s environs. Germanic and Slavic settlements existed side by side here for some time, though the Slavs eventually outnumbered their neighbors. In the 8th century the Slavs built a network of colonies. In the second half of the 9th century a settlement was founded on the hilltop site where Prague Castle was later built. From here the historical city unfurled. Prague soon became the seat of the kings of Bohemia, some of whom also reigned as emperors of the Holy Roman Empire in later times. The city flourished during the 14th century reign of Charles IV, who ordered the building of the New Town, the Charles Bridge, St Vitus Cathedral: the oldest gothic cathedral in Central Europe, which is actually inside the Castle, and the Charles University. At that time, Prague was then the third-largest city in Europe. For centuries, Prague was a multiethnic city with an important Czech, German and (a mostly Yiddish, German speaking) Jewish population. The four cities that previously formed Prague only unified in 1784 to proclaim the Prague we know today. These four cities were Hradcany, Malá Strana, Staré Mesto and Nové Mesto. In 1850 the city under went further expansion when the Hebrew district Jozefov was constructed and in 1883 Vyšehrad. The transformation into a big modern city continued at an increasing rate and Prague swiftly became a well-known point on the map of modern European architecture. During his visit in 1928 Le Corbusier himself commented with envy on Prague’s large Functionalist buildings. Prague grew in terms of both its surface area and population. The Law of Greater Prague of 1920 expanded the city, and in 1922 it incorporated several neighboring towns and citizens. Not even the economic crisis at the turn of the 1920’s could stop the city’s expansion. However, a disruption occurred, causing Czechoslovakia to lose its sovereignty in 1938. 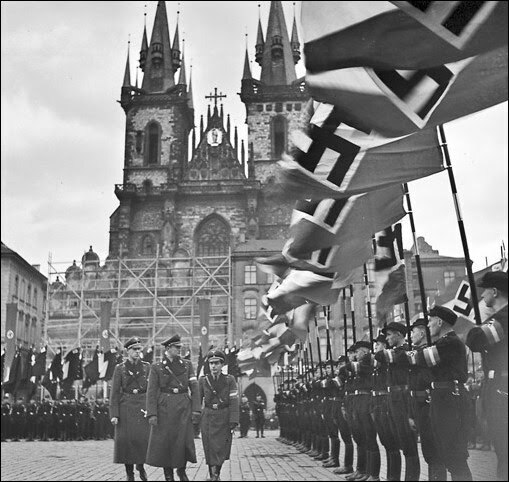 On March 15, 1939, the Germans occupied all of Czechoslovakia and Adolf Hitler came to Prague. Definitely Prague’s most unwelcomed tourist in memorable history! The occupation resulted in the decimation of Prague’s Jewish community, in which roughly 40,000 of its members were murdered. Losses incurred by bombardments and battles during the Red Army’s liberation of Prague, though far from trivial, fortunately they did not damage the overall character of the city. Following the communist coup of 1948, the influx of residents to Prague continued. New residential complexes began to spring up on the city’s outskirts; however, in comparison with the buildings of the 19th century, they were dull and utilitarian. In August 1968 Soviet tanks put an end to the test period of a new democratic attitude. The ensuing era of communist normalization resulted in the stagnation of the city and the brutal intrusion of its historical architectural landscape by buildings of low quality and cold appearances. On May 5, 1945, as Allied forces advanced on all fronts, Czech police officers seized the offices of Prague radio on Vinohradská Street, beginning four days of a popular uprising against the Nazi occupation that ended with German forces streaming out of the city as the Soviets entered. As the police insurgents fought with the Waffen-SS for control of the radio station the announcer, a Czech broadcast the appeal, “Calling all Czechs! Come to our aid immediately! Calling all Czechs!” Czech resistance fighters occupied the headquarters of the Gestapo and the SiPo, barricades were constructed, and by late afternoon Josef Pfitzner, the mayor under the Nazi administration, had declared his allegiance to the Czech National Committee in the Town Hall. The German counter-attack came on May 6 as they recaptured the radio station and carried out bombing operations. On May 7 Waffen-SS units entered the city supported by air strikes, rapidly overcoming resistance. An escaped Scottish prisoner of war broadcast a message to the Allies appealing for help, “Prague is in great danger. The Germans are attacking with tanks and planes. We are calling urgently our allies to help. Send immediately tanks and aircraft. Help us defend Prague. At present we are broadcasting from the broadcasting station, and outside there is a battle raging.” The Americans had already reached Plzeň, but political expediency required that they could make no further advance in order not to cross the demarcation line agreed with the Soviet Union. Prague appeared doomed to fall under the German assault. In a twist of fate the 1st Infantry Division, Russian LiberationArmy, a largely Russian force subordinated to the German High Command, switched allegiance and supported the Prague insurgents against the Germans and halting their progress. With the Soviet Red Army looming on the horizon the Russian Liberation Army commander, General Andrei Vlasov withdrew his forces and retreated to the west to surrender to the Americans, forcing the insurgents to negotiate with the Germans. On May 8 a ceasefire was agreed in which the insurgents agreed to return control of Prague to the Germans and allow them unhindered movement through the city. 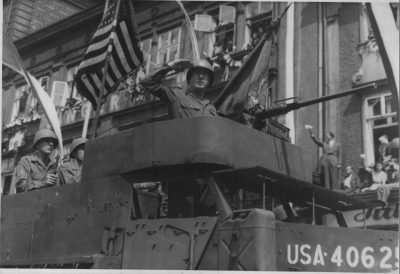 On May 9, a day after VE Day the Soviets entered Prague. The 1976 arrest of the Plastic People of the Universe led to the drafting of Charter 77 which called for the Communist government to uphold the human rights provisions of several agreements, constitutions, and accords it was signatory to. The government’s reaction was repressive and continued throughout the next decade. In 1989, against the background of Solidarność, the fall of the Berlin Wall, Tiananmen Square, the public funeral of Imre Nagy, and widespread opposition to communist regimes throughout the Soviet bloc, Prague riot police brutally suppressed a student demonstration on November 17, sparking off a series of demonstrations that saw hundreds of thousands of people take to the streets. On November 24 all members of the ruling Presidium resigned and on November 29, following the general strike of November 27, communist rule in Czechoslovakia was officially ended. 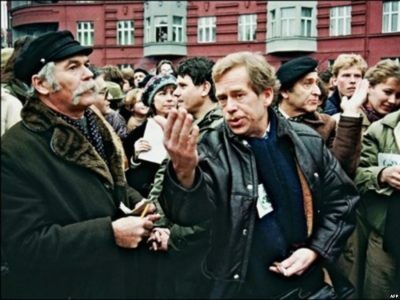 Shortly after President Husák swore in an interim government and on December 29 Václav Havel was elected as President. In the space of a few weeks forty years of communist rule was peacefully ended. The return of freedom after November 1989 offered Prague new opportunities. The founders and holders of the future of this once great country were now solid and determined in their goals to once again restore the heart of Europe to its once glorious perch. It was true that little of the city was destroyed during WWII or the Communist occupation, but neglect had its own detrimental affects on the city. The focus of this new era was to remove the heavy grey soot of disappear from the city, and in doing so, also from peoples hearts and minds.